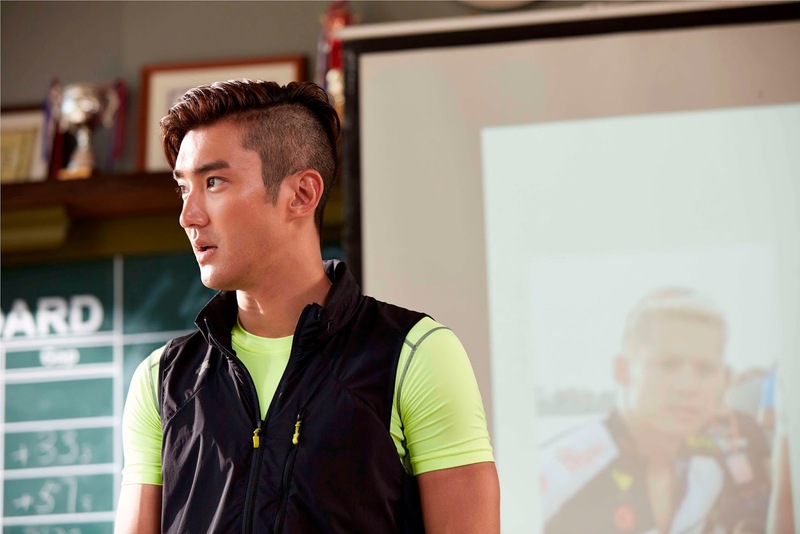 To The Fore (破风) - Exciting Sports Movie with Siwon and Eddie in Tight Suits! Honestly, when I saw the movie title, I had zero interest in catching this. I mean, a bunch of guys on a bicycle with a name "破风" isn't very exciting. I would probably be more intrigued if the title was "破手" (break a hand) or "破口大骂“ (break out in vulgarities). The factor that drew me to catch this movie was solely because CHOI SIWON IS IN TOWN! Thanks to Clover Films, we were able to catch Si Won up close when he was here in Singapore for the GALA premiere! "The wrist tag that gave us entry to the VIP area"
"The amount of screaming girls was CRAZY"
2 lucky girls were invited on stage to play a game with Si Won, and both of them broke down in tears after the game. WHY? They were supposed to PK each other to see who could cycle the most on the bicycle machine. One of the girl, luckily, was wearing a skirt. "Oi Evilbean you pervert, what do you mean luckily?" I am sure the girl would agree with me, that she was lucky to wear a skirt to the GALA premiere, because guess what the gentleman Si Won did? Yeap, he took off his blazer (cue the thundering screams) and covered for her while she was cycling. The girl was so touched, she broke down in tears. SO NOW GIRLS, you now know what to do if you were to attend events like these. WEAR SKIRTS/DRESSES. "Si Won with director Dante Lam"
"WE GOT SPRAYED BY CHAMPAGNE"
"All of us at the front row were just screaming while being showered by the champagne"
With our mood at a high after the event, we proceeded to the theatre halls where the excitement continues. "Do you even lift bicycles bro?" 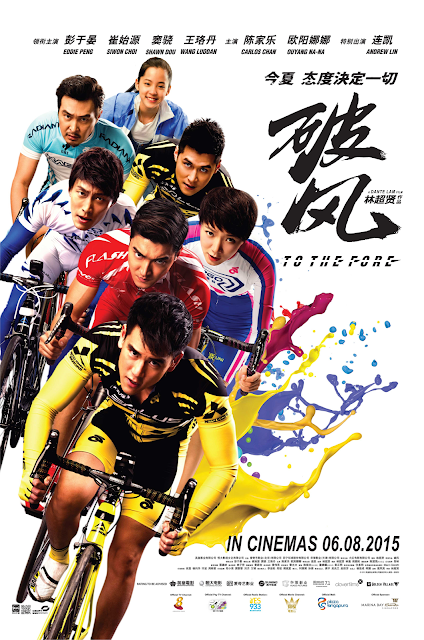 Synopsis: The movie title "破风" comes from a particular role in a bicycle racing game. Called the "破风手", the role of this person is to provide a wind "shield" for the team's sprinter (冲线手), allowing the sprinter to conserve his/her energy for the final burst. 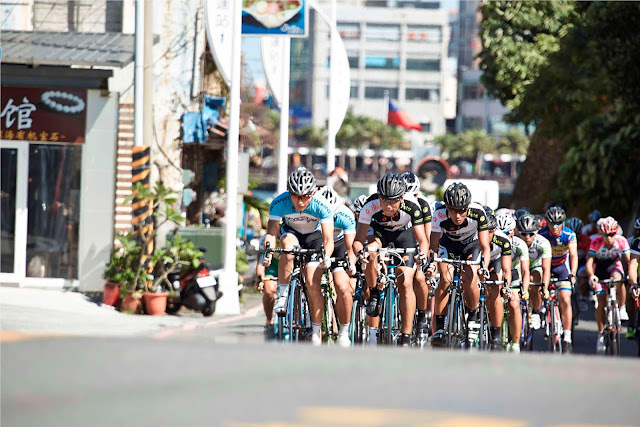 There are a lot of strategies that can be put in use in a game, and this movie will introduce you to this world of bicycle racing and show you some of the tactics that a team would employ during a game. 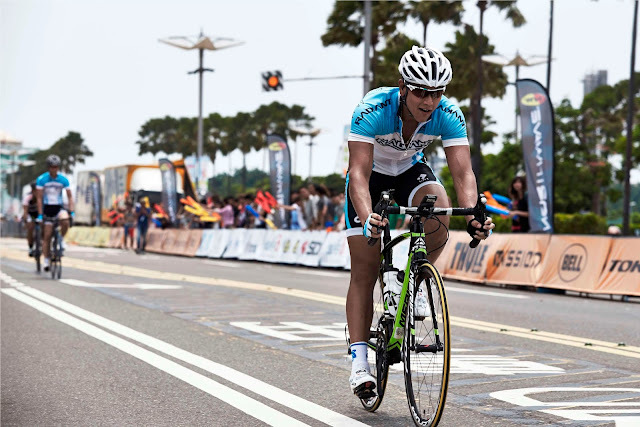 With the 3 male leads Eddie Peng, Shawn Dou and Choi Siwon, you will be taken for a whirlwind spin into the world of competitive cycling. Review: I am not really into sports, much less bicycles. However, you would be genuinely surprised at the thrill and excitement you will get from this film! 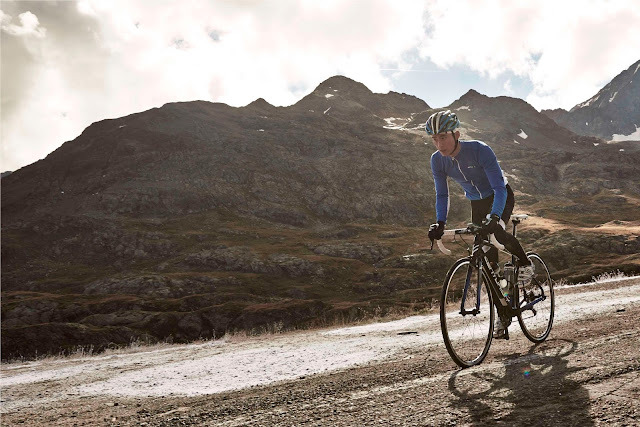 It was an intense ACTION film that opened my eyes about the world of bicycle racing. I am not kidding when I say you can feel the same kind of adrenaline rush watching this film as you would watching F1 or Fast and Furious! However, plot-wise, aside from the 3 male leads, the other characters fall flat and have zero chemistry with each other. I found the triangle love story to be the most excruciating and quite painful to watch. I was simply looking forward to the action/racing scenes. Eddie Peng (playing as Qiu Ming) is undoubtedly the star in this film, with his boyish charms and solid acting. Shawn Dou plays the supporting role and the typical good-guy-but-never-get-the-girl. Screentime for Siwon was very little - I felt that he was more like an extended cameo role in this movie. 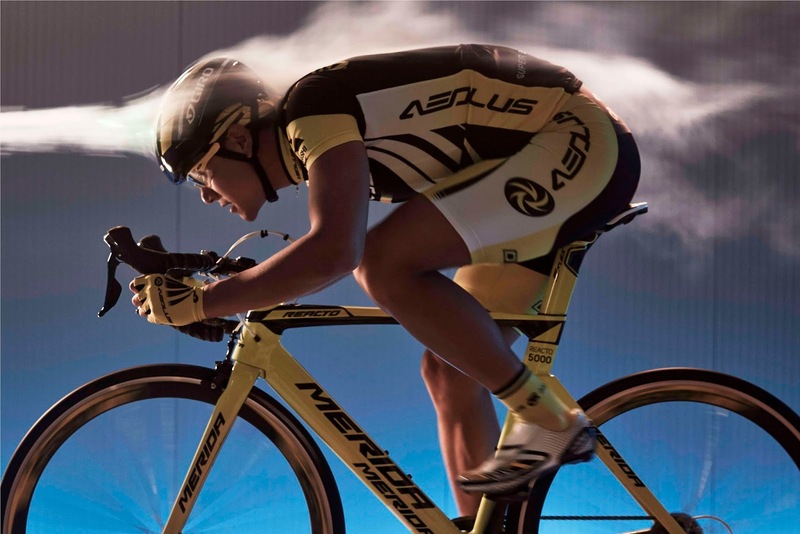 In terms of art direction, I felt that Director Dante Lam brilliantly captured the intensity of bicycle racing with various filming techniques. The cinematography was gorgeous and there were a lot of wide angle shots that showcased the scenery of the different cities. There were also sufficient narration to introduce total noobs like me to some of the terminology and tactics used in the world of bicycles. I must also praise the music scores used in this film. Using dramatic orchestra music during the racing segments, I could feel the loud bass pulsating in my blood! Overall, this movie was still a blast to watch and exceeded my expectations. Even if you are not into sports like me, you would still enjoy this movie thoroughly for the interesting bicycle racing concept. Stay back for: Some of the NG and behind-the-scenes during the credits! Fun fact: Director Dante Lam actually demanded the actors to SHAVE THEIR LEGS. LOL! Siwon even commented: "My legs got so smooth that they didn't seem to belong to a man. I felt apologetic to my mom."